Nathan Killam has been making some headways ever since he graduated from Stout in 2017. His most recent accomplishment is being the lead designer of a limited time Caribou Coffee bag that is themed Minnesota Vikings football. 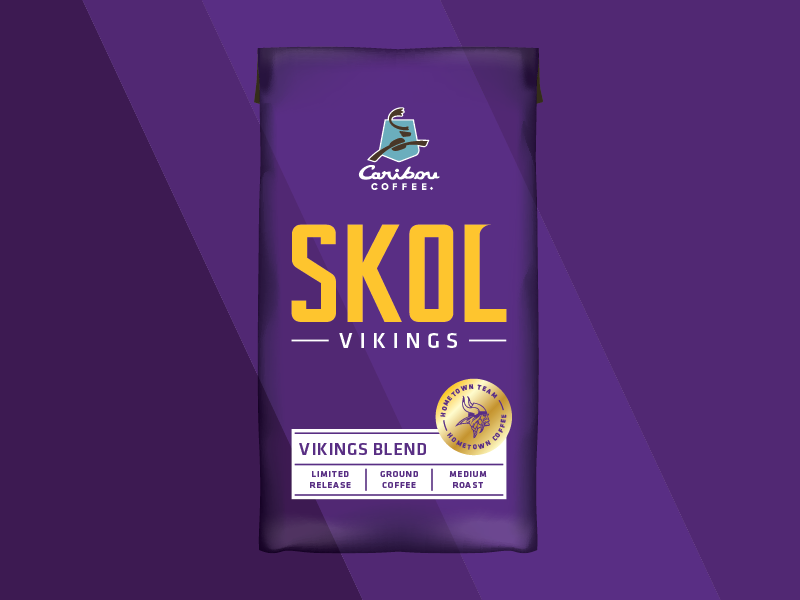 Killam works for a company named Cue, a brand design agency located in Minneapolis, Minn. “Cue has had a long-standing relationship with Caribou Coffee and has done the bulk of their Limited Time Offer (LTO) packaging over the past few years. Some of the other LTO designs included Simple Origin, Gopher Blend, Flavored Coffees, La Minita, and Amy’s Blend were done well before my time at Cue began,” said Killam. 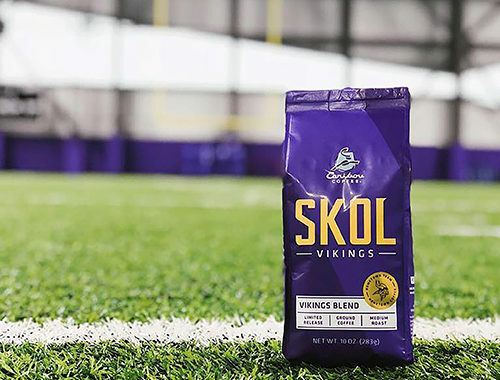 Although still an intern at the time, Killam was approached by Cue to partner with the Vikings and create a coffee blend in their honor. From there, he was assigned as lead designer for the project, working with the Creative Director. “It was a very rewarding challenge to be able to work on something that brought together two very large and popular Minnesota brands in such a fun way. It’s also the first thing that I designed at Cue that’s actually been produced which is a really great feeling to be able to hold the physical item in your hands,” Killam remarked. Killam attended Stout for five years, from 2012 until 2017 while working toward his degree in graphic design and interactive media. “I’m more of a traditional print and packaging designer, but I also really enjoy doing video work, web design/development, and basic animation from time to time. Even though there’s two concentrations of design according to Stout’s program plan, I work in both areas of design to varying degrees based on the projects that I am working on, which definitely keeps things more interesting in the day-to-day,” said Killam. Killam has such a passion for designing, that the work doesn’t stop when he leaves Cue. “In my spare time I am doing some freelance brand design for a small parent coaching company in Southern Minnesota as well as continuing a year-long Polaroid documentary project where I take one photogram every day with my Polaroid camera,” Killam added.